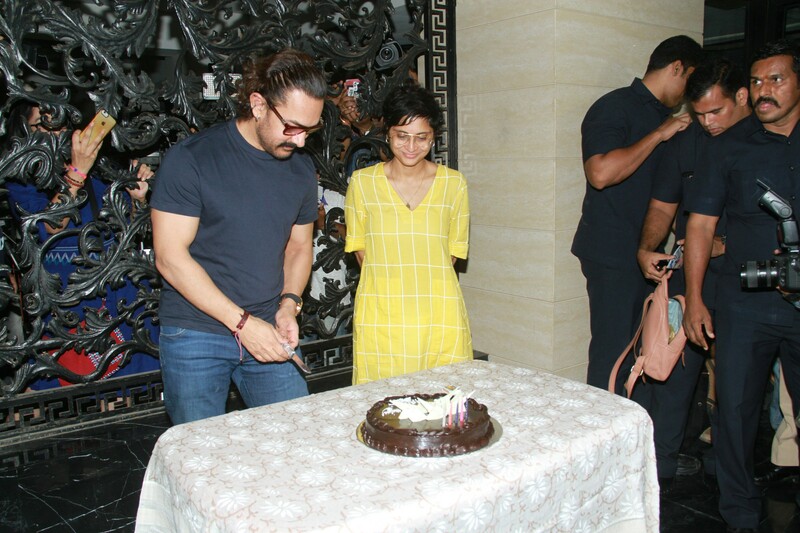 Superstar Aamir Khan who turned a year older today celebrated his birthday by cutting a cake and interacting with fans and media at his Mumbai residence. The actor who was shooting for his upcoming film ‘Thugs of Hindostan’ in Jodhpur flew down to Mumbai to meet his mom and celebrate his birthday with his family. Aamir Khan’s wife Kiran Rao surprised the birthday boy by receiving him at the airport. Continuing his yearly ritual he celebrated a part of the day with media folks. Aamir Khan not only cut his birthday cake but also shared it with the media fraternity, making them a part of his celebration. Holding his hand, Aamir Khan’s wife Kiran Rao helped the birthday boy cut his cake. Kiran Rao and son Azad gifted a dart board to Aamir Khan along with a special note on his birthday. Earlier in the day, Aamir Khan joined Instagram marking the occasion of his birthday. The actor’s post was a picture of his Mother, Aamir Khan also revealed his wife Kiran Rao to be the reason for him joining Instagram. Aamir Khan is currently shooting in Jodhpur for ‘Thugs of Hindostan’ along with Amitabh Bachchan, Katrina Kaif and Fatima Sana Shaikh.